Who should pay for Wyoming’s wildlife? Wyoming should change the way wildlife management is funded, shifting the principal burden off the backs of hunters and insulating other revenue from political meddling, authors of a Wyoming Law Review article say. Instead of relying extensively on the sale of hunting and fishing licenses to fund the Wyoming Game and Fish Department, Wyoming should divert the 4 percent sales taxes paid on outdoor gear and give it to the Department, the article says. Also, the state should take some mineral severance tax money that’s now going into a trust fund and give it to Game and Fish. The sales tax dedication would add $5.9 million a year to the agency’s budget and help distribute funding responsibility to a larger segment of those who enjoy, use or benefit from wildlife, the article says. Also, if only $5 million were diverted to wildlife from the mineral severance tax stream, the result would “have greater value for the state as a whole than contributing such funds to the (Permanent Wyoming Mineral Trust Fund) for distributions to all state agencies,” the article states. “This approach meets the objective of having users besides sportsmen provide funding for wildlife management,” David Willms and Anne Alexander say in the article “The North American model of wildlife conservation in Wyoming… .” That North American model, so-named only about a dozen years ago, is the generations-old practice that sees sportsmen pay for wildlife management through hunting and fishing licenses. Wyoming Game and Fish gets 55 percent of its budget from those license sales, according to a budget presentation officials made to Game and Fish commissioners in September. Another 19 percent is from federal aid, which comes from taxes on shooting and fishing gear. Some shooting tax money is not derived from wildlife-related sport. “Hunters and anglers continue to fund the bulk of our conservation work — approximately almost 60 percent from license fees,” Deputy Director John Kennedy told the Game and Fish Commission in Pinedale this fall. Another 20 percent comes from Pittman-Robertson and Dingell-Johnson tax money, making sportsmens’ contributions “almost 80 percent of our budget,” he said. Named after the sponsors of the federal legislation, the Pittman and Dingell acts respectively tax shooting and angling gear with revenues redistributed across the country. Without new revenue sources, inflation and legislative mandates will catch up with the agency to the point — perhaps as early as 2017 — that Game and Fish will be spending more than it takes in, Kennedy told the commission. The North American Model will not support Wyoming’s responsibility to its wildlife through changing times, the Law Review authors agreed. Pointing to one example, they recounted an unsuccessful attempt by the agency to increase license fees in 2013. Lawmakers and the public “lambasted” the Game and Fish proposal, the article says. At the same time, hunting is less popular than it once was and some license sales are slumping. Yet wildlife management is becoming more complex and costly. “Where sportsmen dollars were once sufficient to manage the state’s huntable and fishable species, they are now diverted to other programs, such as working to prevent the (U.S. Fish and Wildlife Service) from listing species under the ESA, compensating landowners for damage to their property caused by game animals, feeding elk to avoid co-mingling with livestock, and a host of other programs,” Willms and Alexander write. He is a University of Wyoming law school graduate, she an economist there and director of the school’s international programs. Although Wyoming Game and Fish gets a combined 74 percent of its budget from license sales and federal aid, it is seeing increasing support from the Legislature, director Scott Talbott said. 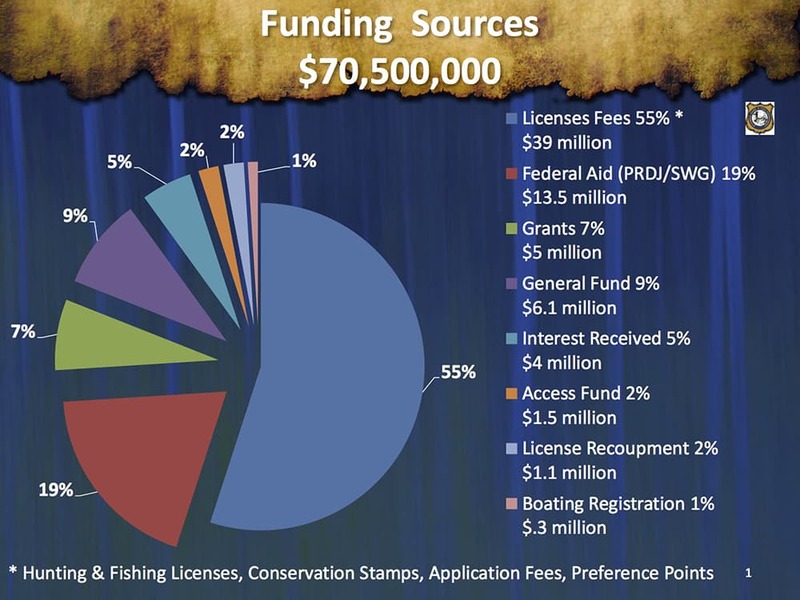 Game and Fish’s FY 2014 budget is $72 million and it gets about $6 million from the Legislature’s general fund appropriations, all earmarked for specific programs. Lawmakers began supplementing the agency’s self-funded budget with General-Fund appropriations in 2005, Talbott said. Today, they have earmarked money for veterinarian services, sage grouse conservation, wolf management, sensitive species and the Aquatic Invasive Species program. They’ve also set up a trust fund to sustain fish hatcheries and a forensics lab, Talbott said. Lawmakers also said that starting in 2014 the agency shall request funding to cover employee health insurance and grizzly bear work. “About $2 million of sportsmen money is spent in management, monitoring and overview of that program,” Talbott said of grizzly conseration. Talbott will work on a request to the Legislature for those funds, he said. Should lawmakers authorize grizzly money as they have proposed, that will be the last non-game Game and Fish program he will ask to be shifted to the general public, for now, Talbott said. There’s a danger in increasing the amount lawmakers appropriate annually to wildlife management, the Law Review authors say. Legislators might vote on appropriations based on issues other than what’s best for wildlife. Consequently, Willms and Alexander propose a constitutional amendment voters would approve. “The Wyoming Legislature should propose a constitutional amendment doing two things,” the authors wrote. “First it should propose to divert funds from taxes already paid on outdoor equipment to the Department,” they said. “Second, it should propose to re-direct a portion of money currently statutorily deposited in the (Permanent Wyoming Mineral Trust Fund) to the Department. Wyoming residents want, and the state’s heritage demands, “a certain degree of political autonomy for the Department,” the authors say. That’s why it generates and approves its own budget. Nevertheless, lawmakers exert considerable oversight and control of Game and Fish. It mandated raises for state employees, for example. “It cost our agency roughly $1 million for all of our employees,” Talbott said. 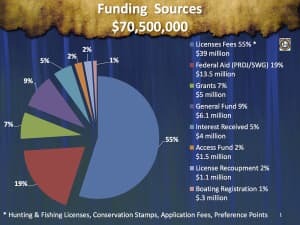 Game and Fish spends 60 percent of its budget on programs and expenses that are required by lawmakers. Thus, the Game and Fish Commission controls only a portion of its annual spending, he said. The $6 million (and growing) earmarked general-fund contributions from the Legislature are part of that influence. While Talbott said he hasn’t seen political meddling with the funds Game and Fish receives, he understands it is possible. Hunters frequently point to photographers, wildlife watchers, backpackers and general tourists as “non-consumptive users” who enjoy wildlife but don’t pay for its management. 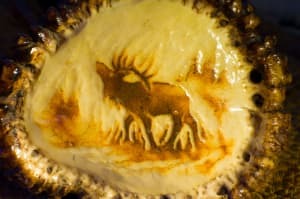 As soon as a newspaper or website in Wyoming publishes a story critical of hunters, the usual flood of letters and comments castigating those “non-consumptive” groups for not contributing to wildlife welfare pours in. But tourists, nature-lovers and photographers are not the only ones that benefit from or “use” wildlife without paying for it, the Law Review authors say. Game and Fish deals extensively with the impacts of energy development on wildlife and its migration. Game and Fish’s winter elk feedground operation and landowner damage claim programs are two undertakings that the article underscores as benefitting those other than sportsmen. Game and Fish has 22 elk winter feedgrounds west of the Continental Divide. In 2012, elk feeding cost $2.9 million. The amount varies annually. The agency paid $1.6 million in FY 2013 for crops and hay that wildlife consumes. That figure also fluctuates widely depending on weather and the price of commodities. 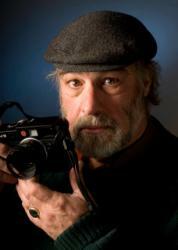 Talbott understands that, he said, and also the role landowners play in wildlife conservation. Game and Fish juggles an annual revenue stream that fluctuates like a roller-coaster. Revenues soar at the beginning of the year and in June when licenses are sold to out-of-staters and residents respectively. In other months, the agency just spends. That requires Game and Fish to keep a $20 million cushion in the bank just to keep its doors open, Talbott said. Sometimes the public and legislators see that bank account — which has grown to $50 million — and wonder whether license fee increases or any other additional revenue is justifiable. That, among a laundry list of other reasons, led to the 2013 debate rejecting higher license fees and a department budget-cutting effort. Game and Fish Commissioners this fall told Deputy Director Kennedy to find a trigger point at which the agency would to come to the Legislature to secure additional money. Meantime, Talbott sees elk and fishing licenses eventually costing more. Perhaps Wyoming should develop a method to account at least for inflation, he said. Next week: Some argue that sportsmen in fact do not pay for the bulk of wildlife conservation in North America, that their contributions, and corresponding influence is overstated. They point to the vast reservoir of public lands — most of it federal — where wildlife thrive in the West as one contribution supported by all, not just hunters. Also, the economic contributions by non-consumptive wildlife users, like birders, wolf- and bear-watchers, may be outpacing the license fees and revenues from hunters, some studies say. Lawmakers cut back on wildlife, fire budgets, February 22, 2013. Sportsmen: Cuts to Game and Fish threaten Wyoming’s wildlife, tourism economy, July 16, 2013. Hunters & Anglers: Restore Wyoming Game and Fish budget, August 27, 2013. Sportsmen to lawmakers: Invest in Wyoming Game and Fish Department, December 17, 2013. Game and Fish license fee increase defeated, February 11, 2014. Wyoming Game and Fish remains at funding crossroads, April 1, 2014. I think visitors and photographers would be delighted to contribute to WG&F – if they had a seat at the table for conservation planning and the fees paid would secure allotted game tags from the total pool. The fee would allow photographers to park and enter the same areas that are usually closed for hunting only. Everyone would win – especially our wildlife.